(Nanowerk News) By way of a light-driven bacterium, Utah State University biochemists are a step closer to cleanly converting harmful carbon dioxide emissions from fossil fuel combustion into usable fuels. Using the phototropic bacterium Rhodopseudomonas palustris as a biocatalyst, the scientists generated methane from carbon dioxide in one enzymatic step. Seefeldt and USU doctoral students Derek Harris, Sudipta Shaw and Zhi-Yong Yang, along with colleagues Kathryn Fixen, Yanning Zheng and Caroline Harwood of the University of Washington, and Dennis Dean of Virginia Tech, published findings in the 22 August 2016, online Early Edition of the Proceedings of the National Academy of Sciences ("Light-driven carbon dioxide reduction to methane by nitrogenase in a photosynthetic bacterium"). 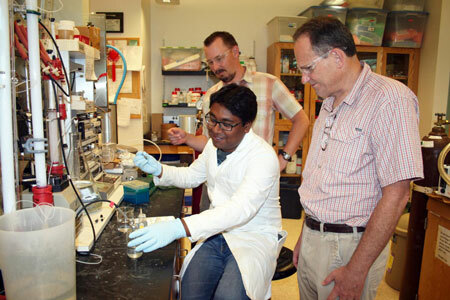 From left, Utah State University biochemists Sudipta Shaw, Derek Harris and Lance Seefeldt are part of the seven-institution, US Department of Energy Office of Science's Energy Frontier Research Center program-funded Center for Biological and Electron Transfer and Catalysis (BETCy) collaboration. The multi-institution team generated methane from carbon dioxide in one enzymatic step.